A film producer who specializes in b-horror and sci-fi features brings his new horror movie and theater experience gimmick to a small Florida town just as Cold War tensions peak during the Cuban missile crisis. Movie theaters use all kinds of gimmicks to get patrons into their cinemas, including things like IMAX, RPX, DBOX, 3D, 4D, luxury seating, waiter services, and whatever else they can. 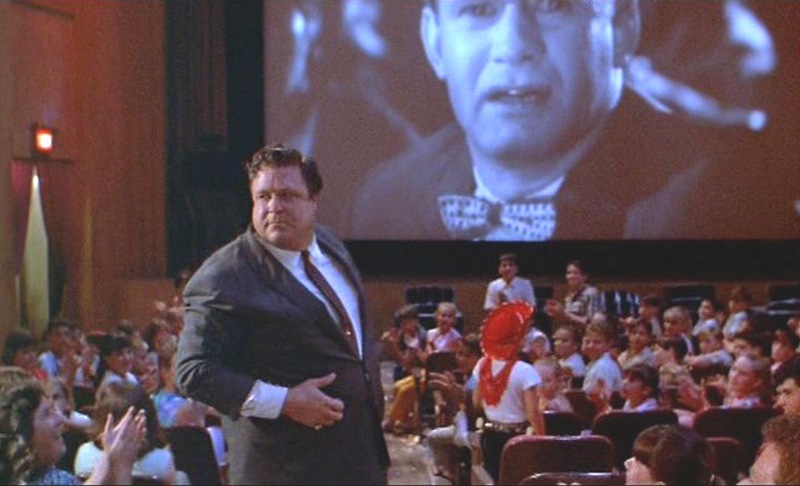 "Matinee" takes a look back on how those gimmicks all began. This movie is directed by Joe Dante, who is known for films like "Gremlins," "Explorers," and "Innerspace." It stars John Goodman as Lawrence Woolsey, a producer of low budget exploitation films. To compete with big studios and get people's butts into seats, Lawrence has come up with various tricks to sell his product and improve the theater-going experience. Also in the film is Simon Fenton as Gene Loomis, a young Navy brat whose father is stationed on a ship at the Cuban missile crisis blockade. This story is primarily focused on Gene, and details his experience leading up to and after Woolsey comes to town. 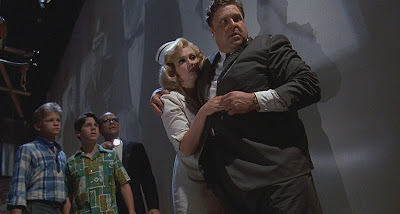 Also in the film are Cathy Moriarty as Woosley's girlfriend Carol, Omri Katz as Gene's friend Stan, Lisa Jakub as the civil rights minded Sandra, and Kellie Martin as the flirtatious Sherry. In case you might be wondering, no, Lawrence Woosley is not a real person, though he is based on an amalgam of real individuals. He is said to be based on William Castle, who used similar gimmicks to the ones Woolsey uses to sell the experience of his horror films. His name is modeled after exploitation film producer Lawrence Woolner, who use to work with Roger Corman before founding Dimension Pictures in 1970. In a lot of ways, "Matinee" is a teen romance that centers around a b-horror movie called "Mant." The events that take place at and around the cinema are the best parts of this dramedy. The little gadgets Woolsey uses to make the movie-going experience more epic are super fun. The impending doom the audience fears, and the panic that ensues in the aftermath play out well on screen in a raucous, silly, and fun way. 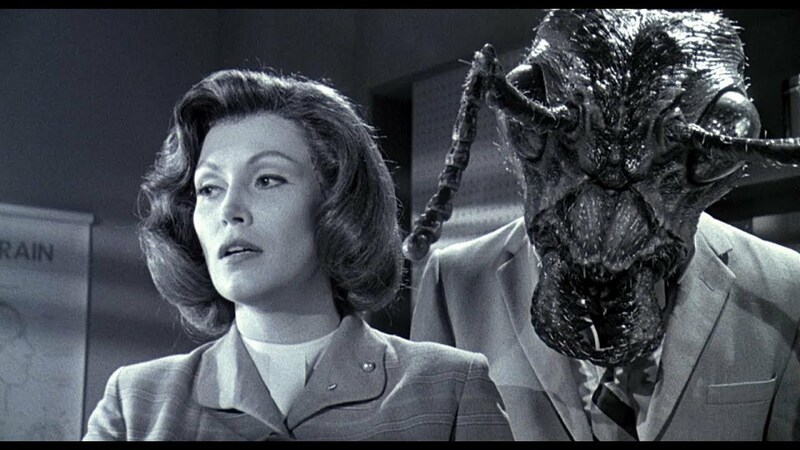 Some of the other parts of the movie, primarily anything featuring the teenaged characters before they watch "Mant," are pretty underwhelming. Director Joe Dante tries his best to character build and set the proper mood and tension surrounding the Cold War era in which the film takes place. This may have aided in selling these giant mutant flicks, but the kid characters are never all that interesting. We don't get too invested in Gene, or his little brother, or Gene's interest in Sandra. In fact, Gene's friend Stan has the far more interesting subplot. His love triangle between himself, Sherry, Sherry's much older ex-boyfriend, plays a much more significant part in the overall story than just about anything including Gene. Luckily, John Goodman offsets a lot of the problems we have with this flick with his classic performance. His boisterous, charming attitude and larger-than-life personality really help garner interest where there's a lack of excitement surrounding the other characters. 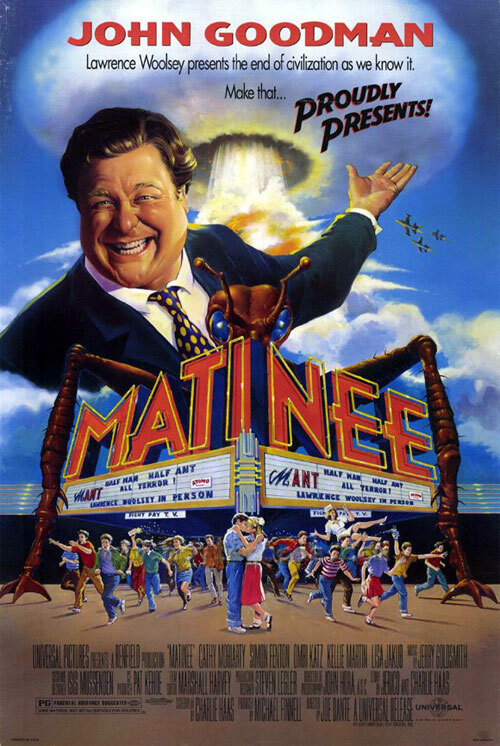 In the end, "Matinee" is a bit of a mixed bag. The stronger parts tend to outweigh the weaker one, so this still wound up being an enjoyable watch for us.